A few years ago, a friend of mine got in trouble. This time, my friend got in trouble for doing the right thing. In solidarity with his union brothers, my friend was walking a picket line because the company he was working for had been taking advantage of employees. My friend was enjoying conversation with his colleagues talking about a number of items in the news, talking about the weather, about fishing, and traffic. My friend cared for his colleagues, and so he explained to them the gospel. To make his explanation clear, he used a simple, two-sided tract called Life or Death. The tract was the size of a business card and had the word “Death” written in such an ornate and elaborate way that any calligrapher would have coveted the skill of its artist. “Death” was the beginning point—and the bad news. The card was designed in such a way that all my friend had to do was flip it around and the word which had looked like “Death” now appeared to say “Life.” From the simple flip from death to life, he shared the gospel message of John 3:16. The workers hearing the gospel message gave it little merit. They held their tongues and kept their death, but not without recourse. They quietly filed a grievance with the union and filed charges against my friend for making “Death” threats against them. harbinger of hate crimes to come arose from Great Britain. 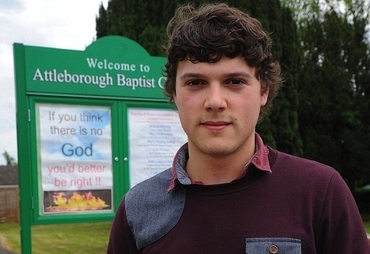 Mark Steyn tells the story of one Robert Gladwin, a twenty-year old peace-loving, uber-tolerant Brit who simply could not tolerate the sign posted by the Attleborough Baptist Church. Still, the twenty year-old Gladwin was offended enough to report the crime to the police, who quickly launched a hate crimes investigation against the church. The pastor of the church, John Rose, removed the sign as a result of the investigation and replaced it (unfortunately) with a sign featuring the message “God loves you” with a meerkat saying “Simples” in a floating speech bubble overhead. Christians must be clear on the gospel message as never before. Any number of issues—Hell perhaps preeminently—will become intolerable hate speech in the days to come. The simple message of eternal life in Christ for those who believe may easily be reinterpreted as a death threat by those who reject the Lord. I recently had a conversation with a friend in which he expressed his disdain for “Christian coercion.” He didn’t exactly call it that, but I think that is an accurate description of what he meant. His concern was that Christians under the threat of eternal damnation pressure others to go against their natural desires. Specifically, the case about which we were speaking involved homosexuality, whether it is a sin punishable by death or a part of nature and, therefore, justified. As I thought about the matter, I had to admit that I agreed with much of what was being said. The notion of Christian coercion makes me cringe, too. I have sat fidgeting uncomfortably while evangelists tell stories of folks who don’t come to Christ in a service and then are killed in car wrecks on their way home [thus, those at this particular service should “make a decision” right now or they, too, might be killed on the way home]. Such manipulation is ugly and demonstrates a lack of trust in the gospel. A preacher need not resort to tricks and manipulation if the gospel really is the power of God unto salvation. So, I think my friend and I agree that torturing people with thoughts of Hell to get them to make a decision is not acceptable. That being said, more substantial issues remain unresolved. For instance, even if we agree that coercion is an ugly thing and ought to be avoided, we still have not answered whether or not Hell is real. In the conversation, my friend was opposed to the concept of eternal damnation for those who practice homosexuality. To that opposition, I would simply say that I do believe Hell is real, but I don’t believe it is reserved for homosexuals. It is reserved for all who remain under the curse of sin apart from Christ. This is what the gospel is all about, of course. All of us have sinned and fall short of the glory of God. And, all of us are under a curse. All of creation is under that curse so that the present course of the world is toward death. The present course of those not covered by Christ is death. (But the free gift of God is eternal life through Christ Jesus our Lord). So, where does that leave those who practice homosexuality? It leaves them in the same place as all the rest of us: Condemned already. [Whoever believes in Christ is not condemned, but whoever does not believe is condemned already, because he has not believed in the name of the only Son of God… This is the judgment: the light has come into the world, and people loved the darkness rather than the light…]. To be sure, such a message is offensive to those who engage in homosexuality (assuming homosexuality is a sin or a mark of unbelief). But the larger reality is that this gospel is equally offensive to all of us. It isn’t just those who practice homosexuality who are condemned already. It is all of us. What this condemned already idea means is that coercion is not the point of our preaching. While it is true that Hell exists and we ought to seek to avoid it, it is not the case that we brandish Hell like a torturer’s scourge until we get the confession we want. Hell is the default setting for us all (gay, straight, bi, polyamorous, polyandrous, transgendered, or whatever). Therefore, our message—like the message of Jesus—is “Repent for the Kingdom of God is at hand.” It isn’t repent or you will burn in Hell. It is repent so you will see the Kingdom of God. Our message is inherently positive. We are ministers of reconciliation. We are proclaimers of good news. We are preachers of eternal life. We are not to stretch folks out on the rack of hellfire until we coerce from them a confession. So, even if my friend and I don’t agree on anything else, we agree that far. As to the rest of his questions concerning whether homosexuality is natural and therefore acceptable… I will try to post on that tomorrow. His questions are yet more penetrating and deserve a thoughtful response.